Last weekend I finally got to do some research I've been meaning to do for a while. Back on my Autumn/Winter plan a couple of the items were basic Merino sweaters from Uniqlo and some of my fellow blogging friends have recommended trying the menswear version. So I've waited patiently for the opportunity to get to a store and compare the men's and women's styles. Last weekend the DH managed to wangle us a wonderful day out courtesy of Chelsea Football club (superb hospitality!) and so I begged him for the chance to do a spot of shopping.....unfortunately not his favourite pastime!! He did relent but only on the proviso that we get on an earlier train (thanks to the marvellous train/ticket inspector that day) and with the stipulation was that I could only visit one shop on South Kensington High Street as that was only a couple of tube stations away from the football ground! Sorry, I'm digressing but this is my way of explaining away the complete lack of pictures! It is hard to shop with your husband pacing up and down the length of the fitting rooms whilst you are trying on! Anyway I tried to make the most of it and took in a heap of sweaters to try on. I took small and medium sizes in the ladies black crew neck sweater and the grey v-neck sweater and I picked up the XS in the men's versions of the same styles. I actually wished I'd taken the men's small as well but I don't think it would have made any difference to the end prognosis (although it could later on). I tried the ladies medium grey neck sweater first and knew immediately I wouldn't need to try the small as I wanted enough room underneath to be able to wear a shirt comfortably, for which the medium is perfect. It was the same story with the black crew neck, fitted not too snug, just right for layering I would say. The womens black crew neck. So then onto the men's version, where I unfortunately only managed to get one photograph. I tried on the black crew neck first and the main difference I found was that the crew neck was higher, which for me was a little on the high side for wearing a shirt underneath. I then tried on the mens grey v-neck, where the v was also a little higher. I think you can just about make out the difference in the necklines between the men's and women's crew. The mens's is quite a lot higher at the neck on me. So what did I go for in the end? I went for the ladies version as I think the style was more suited to how I want to wear mine. If I had plumped for the men's I would have sized up and gone for a small as I would have preferred them to be a bit slouchier. I may go back for more so don't be surprised if I don't end up with the men's later on in the season. 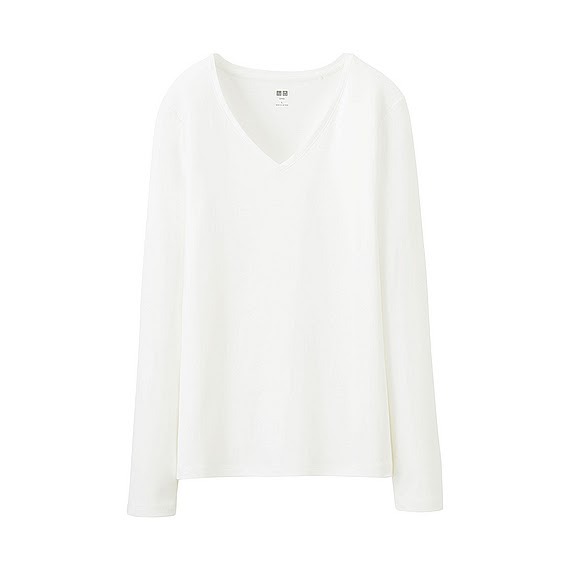 While I was there I also managed to grab one of Uniqlo's Supima long sleeved v-neck t-shirts in white which is a great basic that I am really chuffed with and intend to order in more colours for some A/W layering. It's comes in all the neutrals you would want such as black, navy and grey and it is fantastic quality and value at just £9.90 (since I was considering the Whistles long sleeve layering T-shirt which would still cost £37.50 even with the very generous Grazia 25% off discount). 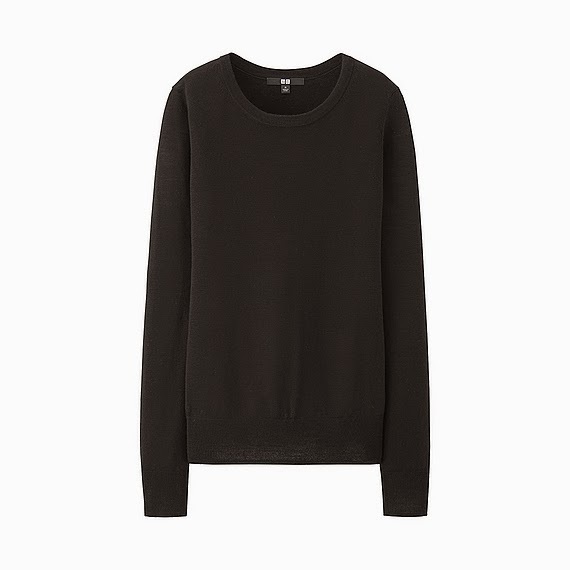 So if anyone was thinking of ordering the Uniqlo merino sweaters, I hope my research has helped although I would recommend trying out for yourselves......just not with the husband in tow! The usual round up of what I've been wearing lately, still trying to eek out some of the Summer wear! As for my original Autumn/Winter plan....well I am pretty much done!! I shall share the purchases with you next time. No deviations as such but a couple of things were substituted due to finding better alternatives or things selling out!! As always I love to read and respond to your comments....let me know what you think!! Looking gorgeous as always! 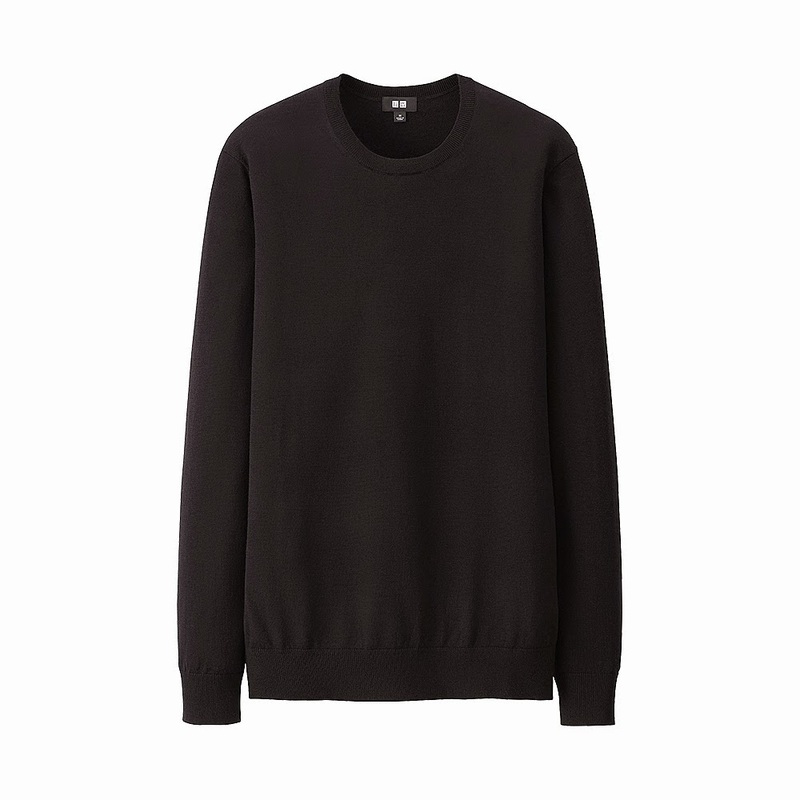 I have the men's uniqlo cashmere crew neck in a medium which I love. - lovely and slouchy! Thanks for the research Michelle, it's good to know about necklines as I'm a bit picky, I don't like them too high. I've got a few Uniqlo T's I've had for ages still going strong, and wash really well. Some lovely looks as always, really like the Stan Smiths. It was painful only being allowed the one stop shop Donna as there was a huge Zara calling me next door!! I was gutted as that it one store I haven't set foot in so far this season and I was desperate for a,look but hey-ho! The jumpers are such a great price.....especially when you compare them to Gap's which are double the price! Glad to be of service!! Yep, I would normally just leave him with a coffee and paper while I do my thing but no chance of that this time as he was in such a rush to get to the game and start quaffing champagne!! Fab research Michelle & lol at your negotiations with hubby!! Looking as gorgeous as always. 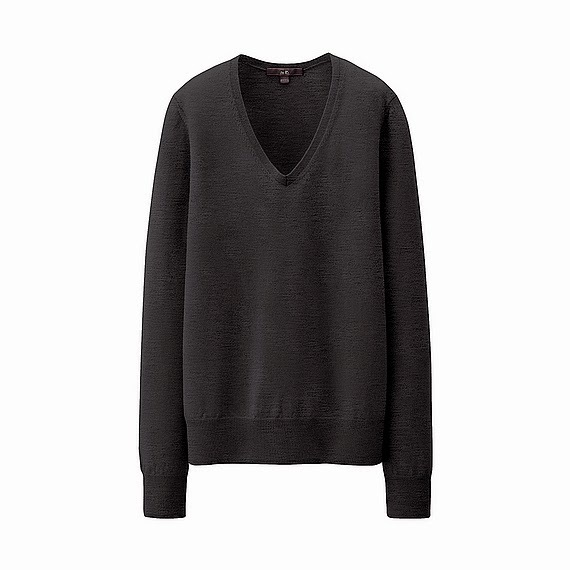 Love uniqlo for merino and cashmere sweaters - haven't tried the men's but think I would still prefer the womens. Love your Zara jacket in first pic! We were in the adidas box at Chelsea a few years ago, it was great. Nearly fainted when Noel Gallagher (teen crush) walked in (they were playing man city). Didn't care about the result (I'm a Leeds fan) but the free champagne & food was great! Great research,I can see the benefits of both men's and women's...men's for that slouchy feel, women's for a more fitted feel of a top as opposed to a jumper. Will have to make a trip when I go up to London this week. I laughed at your comment re your husband. Mine is exactly the same! Btw I notice you wore your Kad sandals this week - seems silly to investigate that now, but they're on sale - and I reckon they will be great stored away for next summer. Are they true to size, and are they comfy (and not too narrow? I have wide-ish feet). If you get the chance try both Carol because it's definitely a case of each to their own with the fit of a sweater! I am so glad to hear from all these lovely comments that I am not alone with a husband who hates shopping!! It's very much an each to their own taste thing isn't it? I prefer the slightly lower/wider crew of the womens but want the men's fit. My XS men's summer navy crew is fine on me but I had to experiment as well as I had ordered a size small before that but found that the shoulders were too wide consequently. It would have worked on someone a little taller than me but being shorter - I have to take in my proportions. In the mens' I size down and in the womens' I size up. And I can totally relate to the shopping torture ... reminds me of when I was only allowed in one shop in London last year during half term - I had a very tentative 5 mins whilst the hubs and 2 boys stood in the doorway. That was pressure! Thanks Sue, I hear what you are saying about the shoulders on the men's sweater if you go up a size. My sister bought me a men's sweatshirt from Primark for my birthday and the shoulder seam is so different than that on a women's top....they are very wide! The sizing down in men's and up in the ladies is great advice now that I think about it! Great post Michelle...I rarely shop with my husband as he is totally allergic to it ! Love all your outfits:) Have a great week! I have a Uniqlo is xs grey. It's too small for layering and the neck is too wide as I like to have a shirt collar peaking out and that's it so I think the men's style might be just what I'm looking for. Thanks for doing the hard work. I only ever take my husband shopping when we are on holiday. Even then it annoys me when he doesn't like the things that I really like. You are most welcome....I had you in mind when I was doing the research!! If you prefer slouchier over slimmer fitting the men's one will definitely be better for you! If even though I had himself pacing up and down it was still nice to fit in 20 mins of shopping whilst we were in London Town!